This set of Unix MCQs focuses on “Using test and [ ] to Evaluate Expressions – 2”. 1. Which one of the following option is used for checking that the string is NULL string? 2. We can use a test to test various file attributes. Explanation: test can also be used to test the various file attributes like its type (ordinary, regular or symbolic link) or its permissions (read, write, execute, etc). 3. Which option is used for checking if the file exists or not? 4. Which of the following option is used for checking if the file is readable or not? Explanation: To check if the file exists and is readable we can use -r option. The syntax is -r filename. 5. Which of the following option is used for checking if the file is writable or not? Explanation: To check if the file exists and is writable we can use -w option. The syntax is -w filename. 6. To check if the file exists and is executable we have to use ___ option with test. Explanation: If we want to check whether the file exists and is executable we have to use the -x option. The syntax is -x filename. 7. -d option is used for checking if the file exists and is a directory. Explanation: If we want to check whether the file exists and is a directory we have to use the -d option. The syntax is -d filename. 8. ____ option is used for checking whether a particular file is older than a specified file. Explanation: If we have two file namely file01 and file02 and we want to check if file01 is older than file02, we have to use -ot option with test. The syntax is file01 -ot file02. Similarly, to check whether file01 is newer than file02 we’ve to use -nt option. These commands work in korn and bash shell only. 9. To check if two files are linked to each other, we can use -ef option. Explanation: If we have two files namely file01 and file02 and we want to check if file01 is linked with file02, we have to use -ef option with test. The syntax is file01 -ef file02. 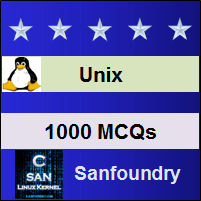 To practice MCQs on all areas of Unix, here is complete set of 1000+ Multiple Choice Questions and Answers.